The School is special in many ways being the first and pioneer school under kalka group of institutions,started by kalka educational society, established in 1974. The foundation stone of the modern building was laid on 22nd march 1988 by Honorable Chief Minister Smt. Sheila Dikshit , then the Minister of Parliamentary affairs. The school is situted in the best locality of south delhi,in lush green area, spread over 4 acres of land. It has a magnificant building with spacious and airy class rooms in a quiet atmosphere conductive for healthy interaction and growth. Campus: The School is special in many ways being the first and pioneer school under kalka group of institutions,started by kalka educational society, established in 1974. The foundation stone of the modern building was laid on 22nd march 1988 by Honorable Chief Minister Smt. Sheila Dikshit , then the Minister of Parliamentary affairs. The school is situted in the best locality of south delhi,in lush green area, spread over 4 acres of land. It has a magnificant building with spacious and airy class rooms in a quiet atmosphere conductive for healthy interaction and growth. Kalka Educational Society is regulated under Socities act 1861. The society was established in 1979 and its main aim and objectives are to spread education and serve tyhe nation through its schools, colleges and institutes of advanced studies in Delhi in neighboring states and more. The society is running the following institutes of higher learning Kalka Institute For Research And Advanced studies at Alaknanda, Kalkaji, New Delhi , Kalka Institute For Research And Advanced studies at Alaknanda, Pratapur, Meerut , Kalka Institute For Research And Advanced studies at Midle East, Kalka Public School, Alaknanda, New Delhi , Kalka Public School, Pratapur, Meerut. Central library: The libraries are the backbone of academic activities of the campuses. The schools libraries are well equipped, spacious and set an example for libraries all over. The store houses of knowledge have vast variety of text books, reference books, national and international journals, research works, CD’s, story books, magazines, periodicals newspaper and video cassettes of different topics. The libraries collectively support the teaching by widening the horizons. 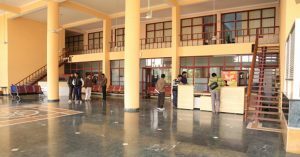 All students, faculty members of the institutions are entitled to make use of library facilities through its various collections. The libraries connect both students and faculty with global resources of knowledge and equip them to meet the challenging new demands. They provide a professional and conducive learning atmosphere for the benefit of the students. All relevant text and reference books are available. The libraries are computerized. Hostel: There are separate hostels for boys & girls with a capacity of about 500 students each. A spacious visitor’s lounge is also there to benefit the visiting parents and guest. The spotlessly maintained and spacious dinning halls in the hostels serve wholesome, nutritious food. Optional washing services are provided in well maintained separate washing areas. Health care facilities are also available round the clock at KGI campus. The full time doctor and nurses are available for the students. The institutes have their own dental hospital coming up very soon as of now it is attached to Govt. P.L.sharma hospital, Meerut. The regular medical check ups are conducted annually for students and staff. Awareness meetings on particulars health problems or issues are also being organized.